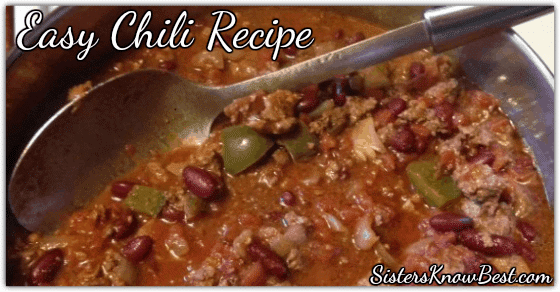 This chili recipe is quick to put together as well as tasty and filling. You can use canned ingredients if you’re short on time without affecting the flavor, but it’s more fun to start with dry beans. I like to make it early in the morning in winter and keep it warm on the wood stove. Soak beans overnight if using dry beans. If using canned beans, rinse and drain well. For soaked beans, drain and cover with fresh water. Bring to a boil until softened and skins crack. Drain well. Brown meat with onions and peppers in olive oil. Place beans, meat, onions, and peppers in large soup pot. Add tomatoes and all other ingredients. Cook on low to medium heat until ready to serve. 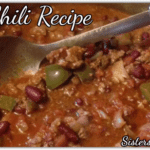 Use this chili recipe as a starting point, and enjoy adding new ingredients — perhaps a little leftover spaghetti sauce or some sausage in combination with the burger. Perhaps chicken. Play with the amount of spice you use. This recipe can be doubled or tripled! Make a huge batch to freeze. My sons tell me chili is better the next day anyway. Enjoy!